Since the August post I have had the delight of meeting Dominique in person on a trip to Montreal and, as you can see, we had a go at a fashion shoot for fun – see the Passion Flower and Miscanthus. We were so pleased with the results that we did further shoots for next month’s post! I will share more of my adventures when I have recovered from jetlag – I only got home 14 hours ago and spent most of that in bed. This Massonia has a somewhat confused taxonomic history. The plant grown under this name for many decades was determined in 2012 to be an impostor. When compared with the original description the cultivated plant did not show some of the key diagnostic features in the original text – the pustules on the leaves were too big and the flowers showed neither the copious nectar nor the ‘green or blue’ throat. The true M. pustulata was rediscovered and fitted the description, the impostor was renamed M. longipes though it is often still seen mislabelled. Whilst I have yet to draw the true M. pustulata I do have a drawing of M. longipes as you can see below. Massonia longipes. Botanical illustration for SBA DLDC portfolio. 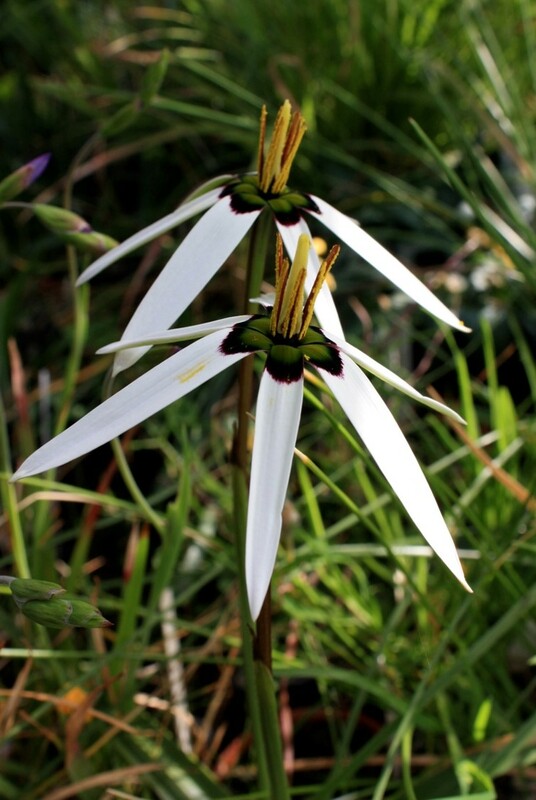 Like the Massonia above, this is a bulb from South Africa. It grows through the winter and flowers in spring before dying back to a bulb in the hot dry summer. I used to find this hard to keep happy in cultivation. Then I took a clue from the habitat I saw it occupying in the wild. The areas where it grows are very wet in winter but very dry in summer. My problems with growing it were related to my treating it like other winter growing bulbs and not allowing for its love of moisture. Changing to a more moisture retentive substrate and watering generously cured the problem and this spring I enjoyed the flowers for the first time in several years. There are pictures hosted by the Pacific Bulb Society of the variations in colour of this species. As well as the form illustrated above there are yellow and pink forms, and the dark centre varies a lot also. Passion Flower, Passiflora caerulea ‘Constance Elliott’. This is a beautiful pure white form of the normally blue and white species. The photo was taken for reference for a future drawing but Dominique liked it and it goes well with the outfit in the collage and in her post. I had the great pleasure of also taking the fashion photos for this one during my very recent visit to Montreal. Passiflora caerulea is one of the more cold hardy Passion Flowers and tolerant of frost down to -10C. It can be very vigorous if happy and producing climbing shoots many metres long. The fruit is not eaten, though not poisonous it is not palatable either. The culinary passion fruit is the fruit of a different species, Passiflora edulis, though there are other species with pleasant tasting fruit. P. caerulea is native to South America. I find a distinct difference between the scent of the flowers of ‘Constance Elliott’ and those of the normal form. Constance Elliott has a stronger and nicer fragrance. This is a very attractive and versatile grass originating in China, with many selections and cultivars. Seen here as a fairly dwarf cultivar in the Montreal Botanical Gardens in an ornamental setting. It is an invasive species in parts of North America. It is very easy to grow, even in non-ideal situations and has a tough perennial rhizome from which new shoots emerge each year. Larger cultivars, up to 4 metres tall are also used as bio-energy crops. And an old man goes to the dogs – see my friend’s posts for details! Dominique persuaded me to model for this during my trip to Montreal. Doggy art by Lisa Lawrence, shirt design by Dominique Nancy of 3C Style. Copyright reserved. Previous Yet another B&W photo challenge! Day 5..
What a terrific post Darren. I love all those flowers and the grass but my favourite photographs are those with you and the dogs. The T-shirt is fabulous. Popping over to the others next. Thank you Brigid! I love dogs so was very happy to agree to model the t-shirt. I don’t think Dominique has posted yet as she did not have a lot of time after I left and then had computer issues. Please look again later😊. Thank you so much Lisa. Modelling for the tee was great fun and Dominique took great photos using my camera which she was not at all familiar with. The passion flower shoot was something we did for a bit of fun and turned out so well that we did loads more outfits for next month. Hopefully I will be able to fly over to do more in future. The smiles are genuine. I have rarely laughed so much or had so much fun😊❤️. Much love and hugs to you too my lovely friend. Beautiful post Darren. I miss you all already so much. I had such a wonderful time with you guys. We really have to plan a trip somewhere so we can see each other again soon. Much love. All beautiful photos – love the dog tee! What an experience Darren, looking forward to hearing more…when you recover! And you have to consider a new modelling career on the horizon! Thank you Marie😄. I am far happier behind the camera. It was huge fun doing these pictures though. I will write more on my trip once I get over the post-holiday return-to-work blues! Looking forward to trip tales to come Darren and well done putting travel fears behind you! Thank you Marie😄. A lot has changed and I am still processing it! Change is good…take your time, enjoy reflecting on it! Absolutely agree with you about Dominique. This project is such fun to do! Well done on becoming a model! Interesting post. Awe thank you Super D. It definitely is not easy, but you’d amazed what you can do when being strong is all you have left. Thank you for your kind words. I appreciate you my friend. Dominique the gossamer fairy? She will love that😊. Thank you Sarah😊. It was a scramble. I wrote much of the text before I left for Montreal but we added the passion flower whilst I was there so I had to write that and add the collages Roda had done. I had hoped to do this on the train home from the airport the day before we posted but as usual the train wifi was not working! So I did it very early on the day of posting and cut it fine indeed. I will check my spam tomorrow! What an interesting post! I love how you collaborated with the fashion and flowers! Great modeling too! Thank you Janie😄. This collaboration is great fun😄. Hello! Have a great weekend!